The past summer marked the third of five field seasons, a key milestone for the second VA Breeding Bird Atlas. Click here (Season2018Summary_Final) to download the post-season summary and catch up on interesting preliminary results and findings from the 2018 breeding season. Check out highlights from our second season of data collection by reading here. Downloadable versions of Atlas coverage and species maps are available on the Atlas Maps page. What is the VABBA2 all about? 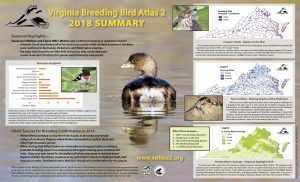 VDGIF Wildlife Blog – Second VA Breeding Bird Atlas Launches! Check out new Atlas article – For the Birds: Project seeks Southwest Virginia volunteers in the Roanoke Times. Cornell’s Birds of North America Online: an excellent reference for comprehensive life history information on all North American birds. Atlas volunteers now receive a discounted membership! Contact Ashley (atlas coordinator) about receiving this discount. Check out a great website for Beginner Birder resources, suggested by Hallie, a young birder from NY! For an interesting page recommended by one of our younger birders, Anabel. Check out Birds in the Air for lots of useful birdwatching links.